Two felt numerals: "1" & "2"
It seems that the old Thing 1 and Thing 2 have decided to retire, so you know what that means: there's a job opening (or, rather, two of them) on the Cat in the Hat's crew of mischievous merry-makers! So if you know a kid (or two kids) with a taste for lighthearted fun, enjoys a little bit of harmless trouble now and then, and doesn't mind hanging out with an anthropomorphic cat and wreaking havoc at people's homes all day long, then we have just the suit. With the help of this awesome Thing 1 & Thing 2 Toddler Costume, your kid will get to have a ton of crazy adventures and express their personality as the Cat in the Hat's loyal sidekick! Luckily there's no training necessary for this job, since your little one was pretty much born to do it anyway. But since they don't have the proper work attire yet, this costume comes with everything they'll need to get rolling with the Cat. That includes the red jumpsuit, a wig for that iconic blue hair, and two felt numbers to slap onto the white circle on the chest ("1" or "2"; we'll leave it up to your kid to decide which one fits). But, you might ask, what if my little ones don't want to ride around in a red box and only be let out of it when the Cat in the Hat needs them? No problem. 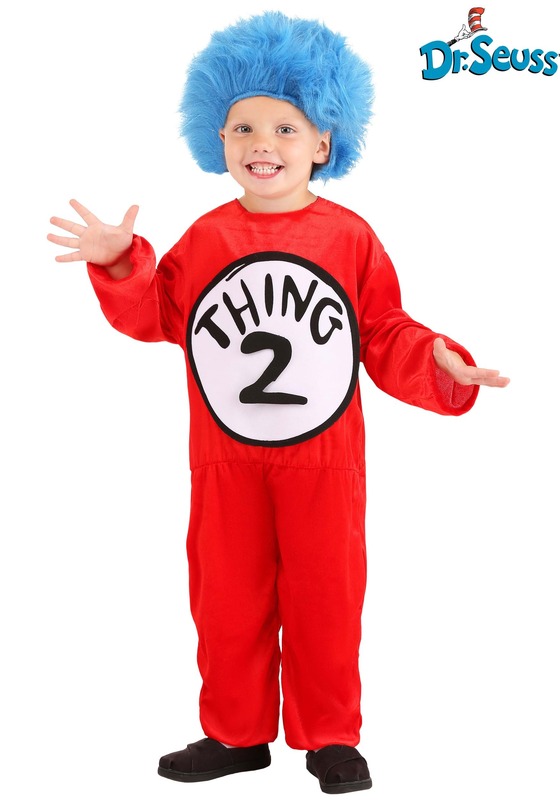 The Thing 1 & Thing 2 Toddler Costume is also perfect for Halloween, so no commitment is necessary. One thing, though: this is a single costume. If you want Thing 1 AND Thing 2 you will have to purchase a second costume.